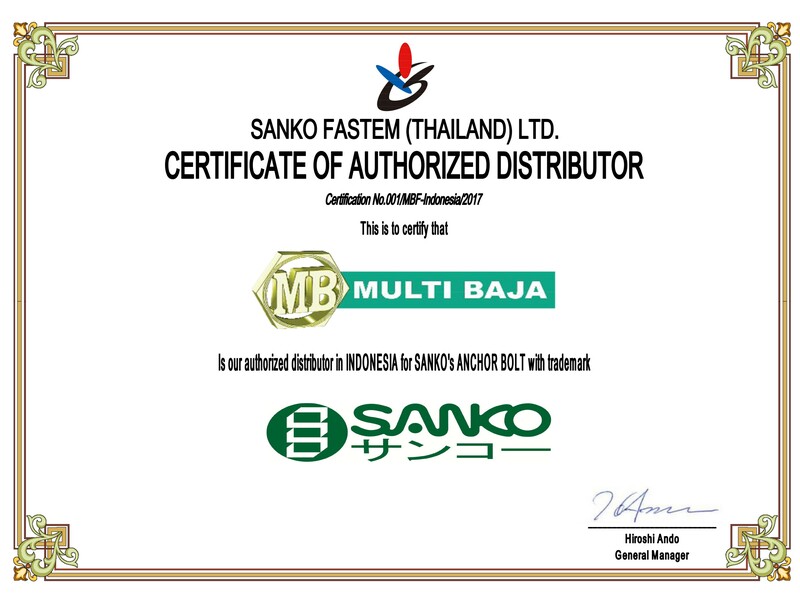 PT Multi Baja Fastindo is a distributor, retailer, and importer in fasteners. 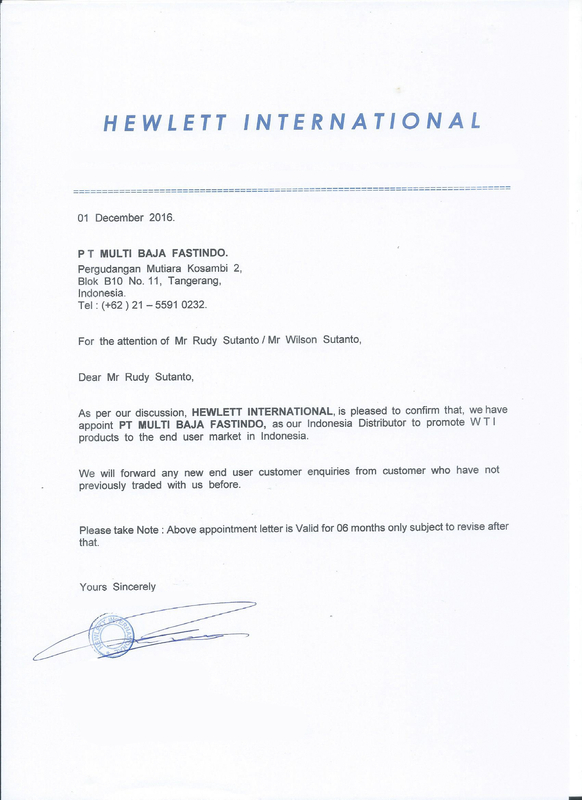 PT Multi Baja Fastindo was established in 1999. Growing from retailer to distributor, we keep adding new fasteners (over 6000 items) and maintain our product quality. We provide fasteners form various material: Carbon steel 8.8, 10.9, 12.9, B7, Stainless Steel 304, 316, 310, 410, Mild Steel 4.6, Nylon, PVC, Brass, Copper, A325, F10T, Hot-Dip Galvanized, etc. 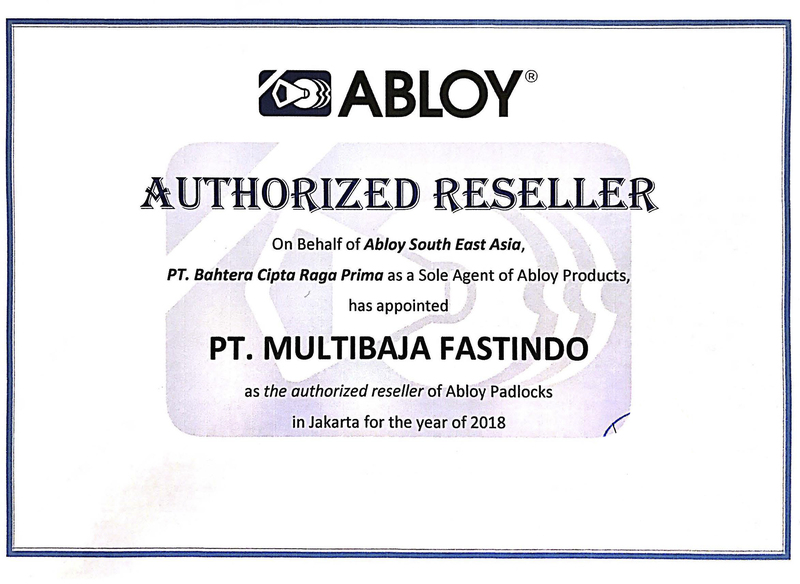 As a result, we are appointed as the authorized distributor of ‘THE’ and ‘TONG’ (world class stainless steel fasteners manufacturer), SANKO (Japanese Anchors), WTI (British Thread Insert & Kits), KEF (Carbon Steel Fasteners), ABLOY (High Security Pad Locks), and NORD-LOCK (Swedish Wedge Washers & Bolts). We are committed to our mission to be a company with superior credibility. Our credibility has been proved by various customers: contractors (infrastructures, buildings, resorts, towers, etc. ), oil and gas, agriculture, manufacturers (used in machines and products), automotives, spare parts, and many more. Our goal is to become leader in fasteners who provides high quality products, serve customers with great service, and continuously improve ourselves. 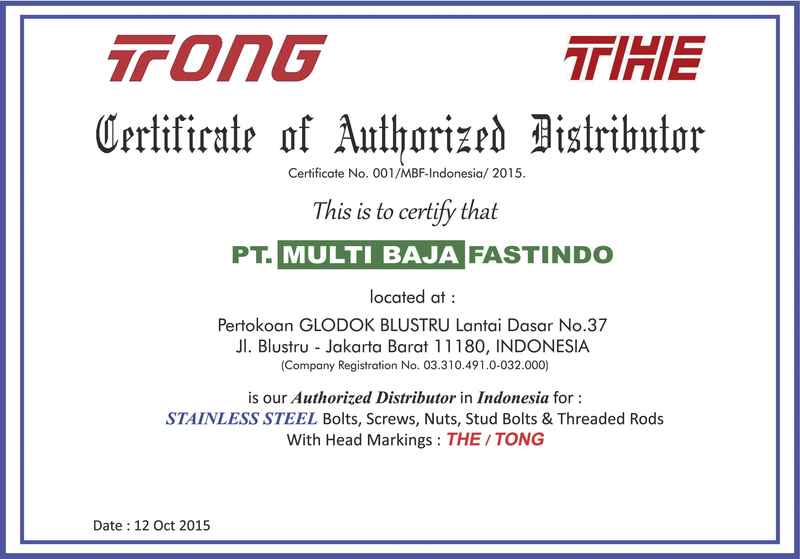 Products that we offer comply with international standards (DIN, ANSI, JIS, etc.) Our products come from legitimate manufacturers who fulfill the international standards of tensile strength, yield strength, physical specification, and material composition. 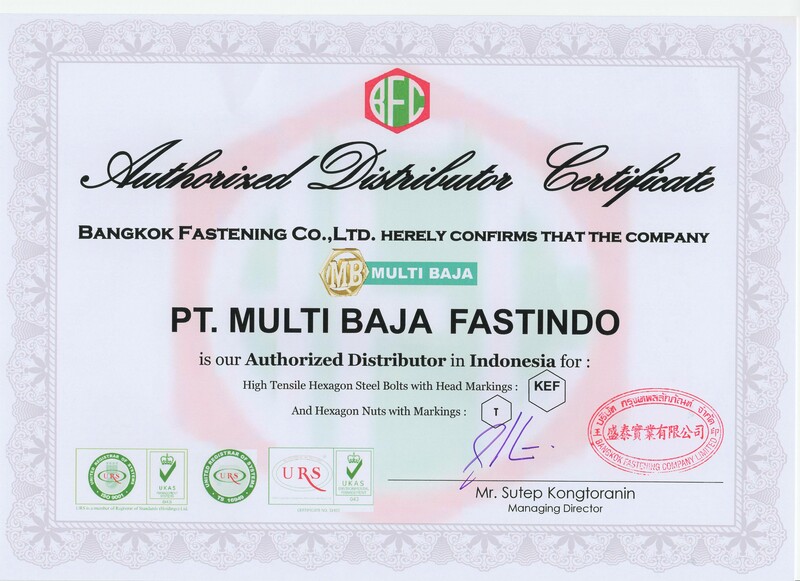 Our thousands of customers have proven our quality value and trusted PT Multi Baja Fastindo as their fasteners supplier. We will never offer low quality fasteners to the customer who needs high quality one. 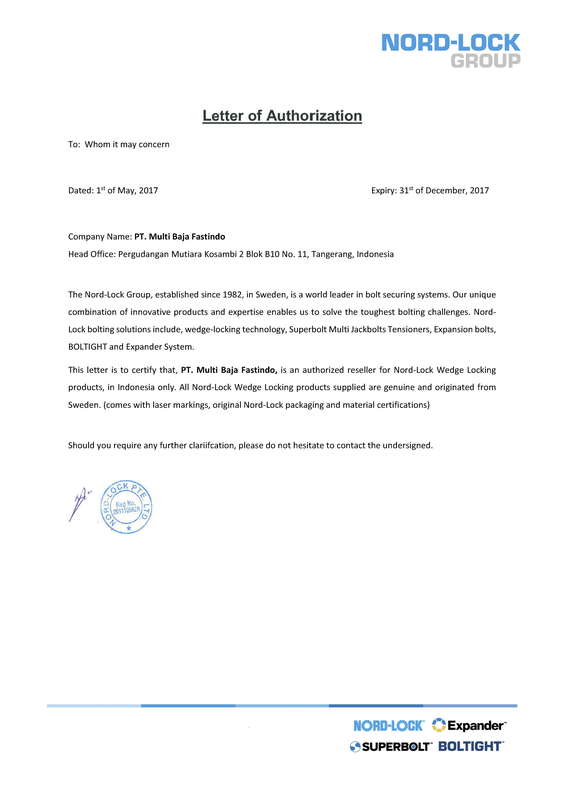 Mill Certificates are available upon request. We commit to give our utmost great service by understanding our customer needs, providing alternatives/solutions, and building a long-term relationship with our customers. We aim to exceed expectation to ensure better and smooth supply chain from customer side. Our commitment: We invest in best people to serve our customers. We always strive for our best. However, we will keep improving ourselves to provide better business experience and to provide more high quality products. "...fasteners which comprise approximately 3% of the total cost of an aircraft, would become such an issue"
"We're getting down to the point that every part, even a bolt, is important"